While carrying the electronic key, press the button on the trunk lid. When all the doors are unlocked with the power door lock system, the trunk can be opened without carrying the electronic key. Press and hold the switch. Turn the key clockwise to release the trunk lid. A buzzer sounds to indicate that the trunk has been opened. The trunk light turns on when the trunk is opened. ●When all doors are being locked, closing the trunk lid with the electronic key left inside the trunk will sound an alarm. In this case, the trunk lid can be opened by pressing the trunk release button on the trunk lid. ●Even when the spare electronic key is put in the trunk with all the doors locked, the key confinement prevention function can be activated so the trunk can be opened. In order to prevent theft, take all electronic keys with you when leaving the vehicle. ●Even when the electronic key is put in the trunk with all the doors are locked, the key may not be detected depending on the places and the surrounding radio wave conditions. In this case, the key confinement prevention function cannot be activated, causing the doors to lock when the trunk is closed. Make sure to check where the key is before closing the trunk. ●The key confinement prevention function cannot be activated if any one of the doors is unlocked. 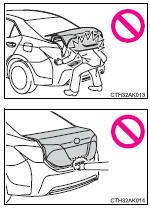 In this case, open the trunk using the trunk opener. The trunk lid can be opened by pushing the glow-in-the-dark lever located on the inside of the trunk lid to the side. The lever will continue to glow for some time after the trunk lid is closed. The trunk unlocking operation can be changed. ●Keep the trunk lid closed while driving. If the trunk lid is left open, it may hit near-by objects while driving or luggage in the trunk may be unexpectedly thrown out, causing an accident. In addition, exhaust gases may enter the vehicle, causing death or a serious health hazard. Make sure to close the trunk lid before driving. ●Before driving the vehicle, make sure that the trunk lid is fully closed. If the trunk lid is not fully closed, it may open unexpectedly while driving, causing an accident. ●Never let anyone sit in the trunk. In the event of sudden braking or a collision, they are susceptible to death or serious injury. ●Do not allow a child to play in the trunk. If a child is accidentally locked in the trunk, the child could suffer from heat exhaustion, suffocation or other injuries. ●Do not allow a child to open or close the trunk lid. Doing so may cause the trunk lid to operate unexpectedly, or cause the child’s hands, head, or neck to be caught by the closing trunk lid. Failure to do so may cause parts of the body to be caught, resulting in serious injury. ●Remove any heavy loads, such as snow and ice, from the trunk lid before opening it. Failure to do so may cause the trunk lid to suddenly shut again after it is opened. ●When opening or closing the trunk lid, thoroughly check to make sure the surrounding area is safe. ●If anyone is in the vicinity, make sure they are safe and let them know that the trunk is about to open or close. ●Use caution when opening or closing the trunk lid in windy weather as it may move abruptly in strong wind. ●The trunk lid may suddenly shut if it is not opened fully. It is more difficult to open or close the trunk lid on an incline than on a level surface, so beware of the trunk lid unexpectedly opening or closing by itself. Make sure that the trunk lid is fully open and secure before using the trunk. ●When closing the trunk lid, take extra care to prevent your fingers etc. from being caught. ●When closing the trunk lid, make sure to press it lightly on its outer surface. If the trunk handle is used to fully close the trunk lid, it may result in hands or arms being caught. ●Do not attach any accessories other than genuine Toyota parts to the trunk lid. Such additional weight on the trunk lid may cause the lid to suddenly shut again after it is opened.